Welcome to the NEW WeAllSew! Hello and welcome to the NEW WeAllSew blog! We’ve been working hard to create the new WeAllSew blog, and we welcome all our friends from the old WeAllSew, the Bernina USA blog, and theSewingRepublicsites, along with many new readers. WeAllSew is a place where all of us – sewers and crafters of all ages and skill levels – can celebrate and share our love of sewing through ideas, projects, patterns, and tips, and inspire a whole new group of sewers to get stitching. 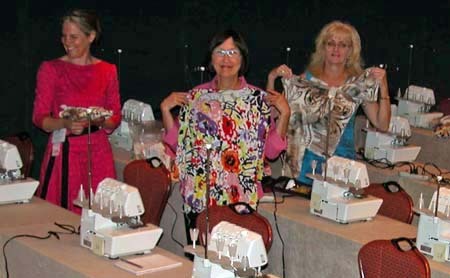 It doesn’t matter what brand or type of sewing machine you own. Because we all sew, we all share the same passion for creating unique treasures. Whether you are learning how to sew for the first time or want to perfect your skills, the new We All Sew blog and online community can help! Our blog contributors and sewing experts provide tutorials, easy step-by-step instructions, new product information and inspirational ideas just for you. WeAllSew is brought to you by BERNINA USA, an independent family-owned business designing and making top-of-the-line sewing machines representing the best in innovation, quality, precisions and ease of use. Want to learn more about BERNINA? Click here to find a BERNINA store near you. 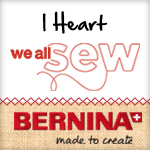 Feel free to contact us with project ideas or topic suggestions at weallsew@berninausa.com, and stay connected to the We All Sew community by becoming a fan of BERNINA USA on Facebook and following us on Twitter. 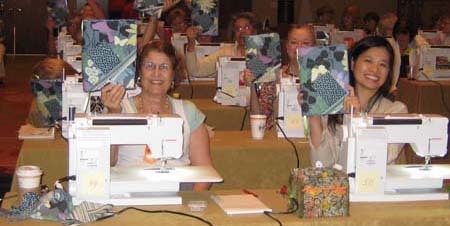 Share, get inspired, and get stitching! P.S. Want to show your love of sewing and share WeAllSew with friends? Here are two WeAllSew badges for you to share on your website, blog, facebook page and more!